Spotlight: Dover, NH (PDF)(1 pg, 885 K, About PDF). Is your community included? Search the database. Learn how New England communities prepare for climate change through resilience ResilienceThe ability to anticipate, prepare for, and adapt to changing conditions and withstand, respond to, and recover rapidly from disruptions. and adaptation AdaptationTaking actions to avoid, benefit from, or deal with current and future climate change. Adaptation can take place in advance (by planning before an impact occurs) or in response to changes that are already occurring. The Resilience and Adaptation in New England (RAINE) database is a collection of vulnerability, resilience and adaptation reports, plans and webpages at the state, regional and community level. You can search the entire database by state, population, type of plan or product, topic, climate impacts, programs, tools, funding, and partners. You can explore the most common subjects by topic, impact, partner, tool, and funding source. This information is pulled from the database quarterly and changes to reflect the information entered into the database. These examples highlight unique practices including the use of incentives, collaborations, ordinances, etc. We have captured many, but not all, examples of resilience and adaptation efforts in New England. If we missed a document, program, plan, etc. that you are aware of please let us know. 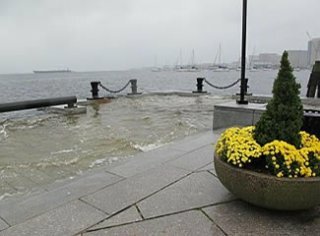 Boston sidewalk underwater at astronomical high tide.